...and he strikes like THUNDERBALL! Fresh on the heels of the announcement that Danjaq LLC, the producer of the James Bond films, and Metro-Goldwyn-Mayer (MGM), the long-time distributor of the Bond films, have acquired all the rights and interests relating to James Bond from the estate and family of the late Kevin McClory, after legal and business disputes that have arisen periodically for over 50 years – December 18th 2013 will see the auction at Bonhams (Knightsbridge) of a number of unique and historically important items related to the labyrinthine story of the writing and subsequent film project that would eventually evolve into the fourth James Bond film Thunderball (1965) – the Biggest Bond of All! 007 MAGAZINE & ARCHIVE Limited challenged whether the claim was misleading and could be substantiated in a complaint to the Advertising Standards Authority. After assessing the complaint the Advertising Standards Authority found in favour of 007 MAGAZINE & ARCHIVE Limited and sanctioned the action that the MI6 Confidential ad must not appear again in its current form. The world’s Number One James Bond publication is set to return in print in its 30th anniversary year. After a 3-year ‘sabbatical’ as an online Internet publication only, 007 MAGAZINE is set to return during summer 2009 with not one, but two separate titles. The sister publication will be entitled 007 MAGAZINE ARCHIVE FILES, and the first issue will feature articles and many never-before-seen images from the making of On Her Majesty’s Secret Service, in the film’s 40th anniversary year. Each issue of 007 MAGAZINE ARCHIVE FILES will concentrate on aspects of one Bond film in the series’ history, while the original 007 MAGAZINE will contain a varied selection of features relating to all aspects of the James Bond phenomenon. Both 36-page ‘Limited Edition’ issues will retail at £9.99 each (plus £1.50 p&p - $20 surface mail) and will be published at intervals throughout the year on a non-subscription basis. The 007 MAGAZINE website will continue to feature a large free view area while its 1,000-page feature-packed encrypted pay-to-view archive area will offer a newly reduced 12-month subscription fee of £9.99 ($16). The current £4.99 ($7.50) monthly subscription to the encrypted pay-to-view area will remain the same. 007 MAGAZINE first appeared in print in April 1979 and premiered on the World Wide Web during 1997, while its more recent web persona evolved during September 2004. 007 MAGAZINE publications and website feature the definitive work on the subject, covering everything relating to the James Bond phenomenon and spanning six decades from 1952 to the present day. During its 30-year history 007 MAGAZINE & ARCHIVE has become THE foremost worldwide focal point for countless enquiries relating to Bond, James Bond – and provides the ultimate resource for James Bond enthusiasts worldwide, and a unique commercial picture agency & information centre for the world’s media. The 007 MAGAZINE ARCHIVE is the largest commercial archive of its kind in the world and many of its never-before-seen images will feature regularly throughout the pages of both 007 MAGAZINE publications. …that neither the James Bond Nederland or the James Bond Web Italia websites are endorsed in any way whatsoever by 007 MAGAZINE & Archive Limited. Both websites are using images lifted directly from the 007 MAGAZINE website and its printed publications (which are exclusive to the 007 MAGAZINE Archive) without prior permission. We would encourage all Bond enthusiasts, whatever their nationality, to view these images at www.007magazine.co.uk at their original size and superior quality. For Bond Lovers Only! – 007 MAGAZINE – Nobody Does It Better! BUYER BEWARE! BUYER BE AWARE! The Oddjob hat offered in Julien’s Auctions on June 17th, 2006 at Planet Hollywood New York is not a hat worn in the 1964 film Goldfinger by wrestler Harold Sakata as stated in Julien’s Auctions’ catalogue and publicity material. The hat in question is in fact the bowler that Harold Sakata wore for his wrestling appearances after the film Goldfinger was released, when he was then billed as ‘Oddjob’ on the wrestling circuit. Prior to 1964 and his appearance in the James Bond film Goldfinger he was featured on wrestling bills as ‘Tosh Togo’. Sakata NEVER at any time actually wore a steel-brimmed bowler hat in the film Goldfinger. The hat Harold Sakata actually wore in Goldfinger was a square-crown bowler purchased for the film production from hatters James Lock & Co of St. James’s Street, London. 007 MAGAZINE publisher and renowned Bond archivist Graham Rye sold THE Oddjob hat from his archive at the CHRISTIE’S September 17th 1998 James Bond auction, and which was purchased for a record-breaking £62,000 by the Bond filmmakers EON Productions Limited. 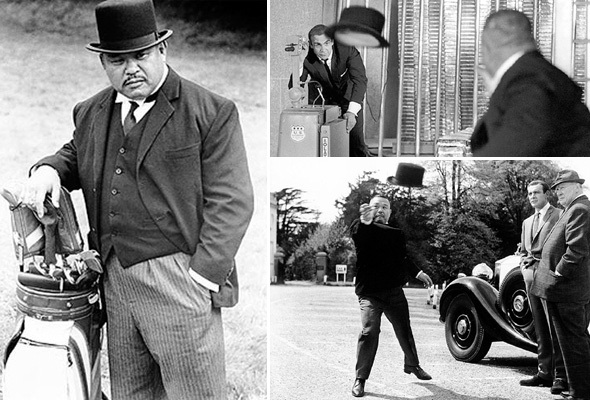 The Oddjob bowler sold by CHRISTIE’S was a special effects hat created by Oscar-winning SFX technician (the late) John Stears and his team for use in the production Goldfinger, and remains the only surviving Oddjob hat with an authentic link to the film, and was featured in recent years as a ‘star’ attraction in EON Productions’ ‘Bond, James Bond’ exhibition at the Science Museum in London, and The Henry Ford Museum in Dearborn, Michigan. While this is regrettable, spiralling production, printing, and administration costs make the continuation of 007 MAGAZINE in its current printed format commercially unviable. However – we, and I hope you the reader, want 007 MAGAZINE to survive and continue to entertain James Bond enthusiasts worldwide for many years to come! Although we’re sad to see 007 MAGAZINE cease as a paper quarterly, we’re very excited about its varied and long-term possibilities on the World Wide Web. We will continue to bring readers the same unique look at the world of James Bond with exclusive articles, interviews and photo-layouts, but now partnered with even more rare and never-before-seen imagery, and reproduced in a vibrant, clearer and more exciting medium. Quite simply – 007 MAGAZINE will never have looked better! While Bond news, forums, and fan club websites proliferate, the 007 MAGAZINE website will continue to consolidate its unique expert presence on the World Wide Web as the world’s foremost James Bond archival resource. Nobody does it better! From August 1st 2006 – 007 MAGAZINE (issue #49 onwards) will become part of the ‘pay-to-view’ area on our website at www.007magazine.co.uk where the 12-month subscription fee will cost £19.99 ($37/€29). Once your subscription payment has been accepted you will be able to login to the members' area of 007 MAGAZINE and also access and update your unique profile. Your subscription will enable you to access all areas of 007 MAGAZINE OnLine, including special reports & supplements, together with all the other varied content of the ever-growing 007 MAGAZINE Articles Archive area, and other great new features. We are also introducing a £4.99 ($10/€8) monthly fee for the casual James Bond web-surfer, who may only wish to browse the ‘pay-to-view’ area before committing to an annual subscription. Current subscribers who are still owed printed issues of 007 MAGAZINE will receive a FREE 12-month subscription to the new webzine when 007 MAGAZINE OnLine is launched in August. Those subscribers still owed printed magazines will be contacted by letter and informed how to claim their free subscription. We thank all our subscribers for their loyal support over the last 26 years and hope you’ll continue to support 007 MAGAZINE in its new 21st Century incarnation, to infinity – and beyond! After two years under the umbrella of the ‘The James Bond International Fan Club Limited’, Graham Rye, 007 MAGAZINE editor & publisher, and Creative Director of the original ‘The James Bond 007 International Fan Club & Archive’ has formally decided to part company with the new club organised by Yorkshire businessman and Bond fan David Black. ‘The James Bond International Fan Club Limited’ under the Chairmanship of David Black is not connected in any way with ‘The James Bond 007 International Fan Club & Archive’, or its publications and events, published and organised from 1979 to 2001 by Graham Rye and his team and contributors.